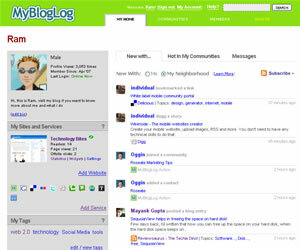 MyBloglog undergone a major overhaul this weekend, added activity streams to the profile pages. MyBlogLog now tracks all of your digital data from various social networks and sites. The new feature is an activity stream of all your friends, contacts in MyBlogLog. Currently it tracks various networks including, Delicious Bookmarks, Youtube, Digg, Stumbleupon, Twitter updates, etc. From your profile page you can see all your friends activity, provided they have activated various services in their mybloglog account. MyBlogLog will face stiff competition in this space from Friendfeed likes, but the only advantage it has is lot of bloggers already using MyBlogLog widgets. I too saw the changes in Mybloglog. Yahoo seems to be making good changes in this network.